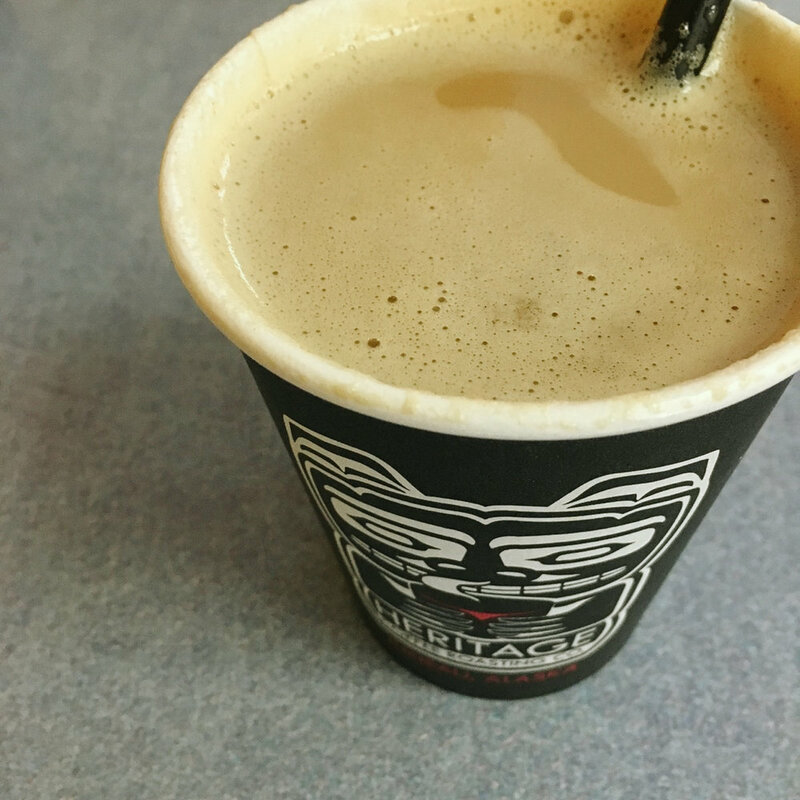 Places to Eat in Juneau, Alaska ↠ Heritage Coffee. If you're in Juneau exploring for a few days, you definitely want to fuel up on a good breakfast and coffee before heading out on your adventures. I mentioned Sandpiper Cafe before, but another great place is Heritage Coffee. They have several locations where you can grab coffee and another in the valley where you can also eat. I prefer the valley location since it's a bit quieter, and of course I always grab some food. The baja breakfast burrito is my breakfast pick. The hazelnut creme or chai latte are my favorite Heritage Coffee orders. I've also tried a few of their wraps and paninis for lunch and they're all great. Are you taking a trip to Juneau this summer or planning an epic vacation for the future? If so, I'd love to know any questions you have in the comments or by email, I'll cover them in my next travel post! You can find the rest of my Juneau recommendations here. 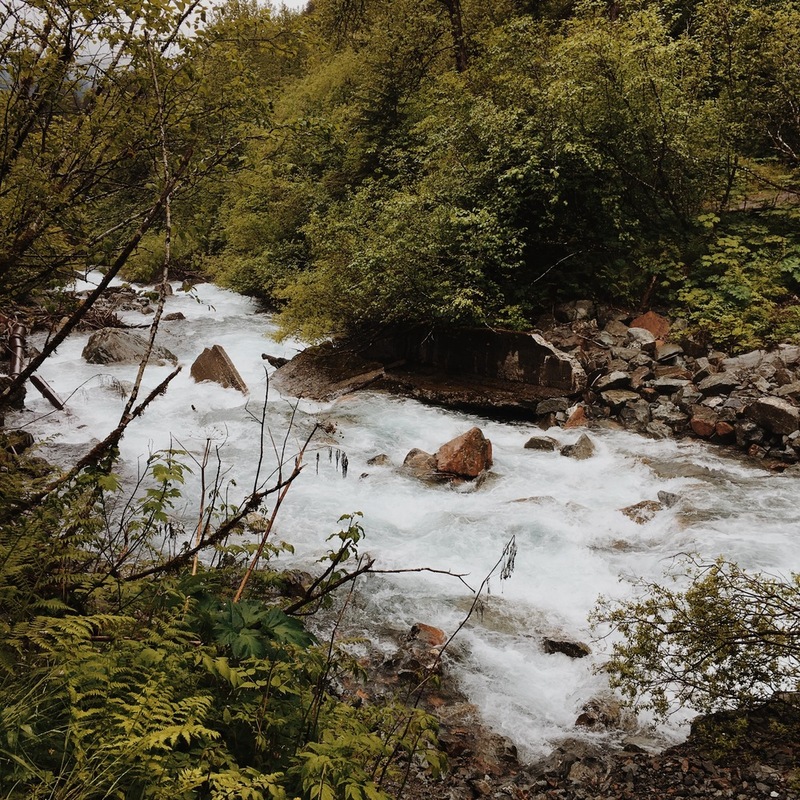 Places to Visit in Juneau, Alaska ↠ Gold Creek Flume Trail. 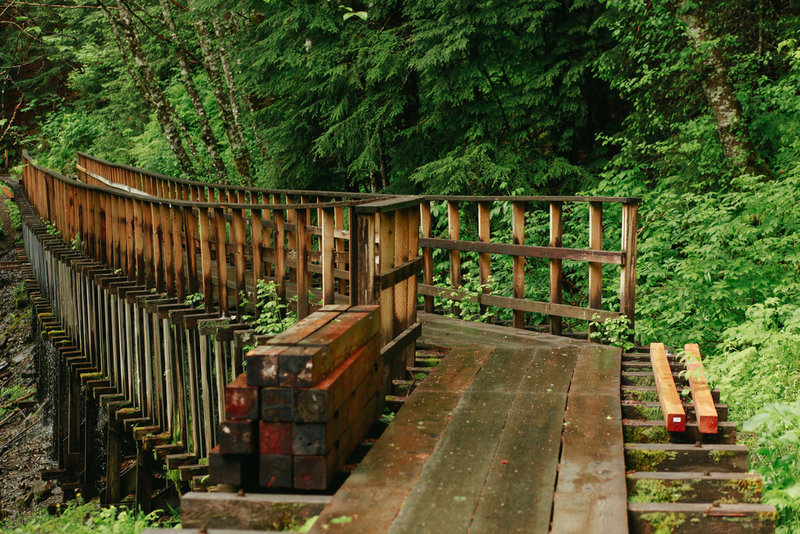 Gold Creek Flume Trail in Juneau, Alaska is a great easy hiking trail near downtown Juneau. We tried this trail for the first time in May when we made a trip for a wedding I photographed on top of Mendenhall Glacier (photos to come!). It was so nice to find an easier hike after all the uphill trails we'd done already that week. Especially since I was 26 weeks pregnant at the time. 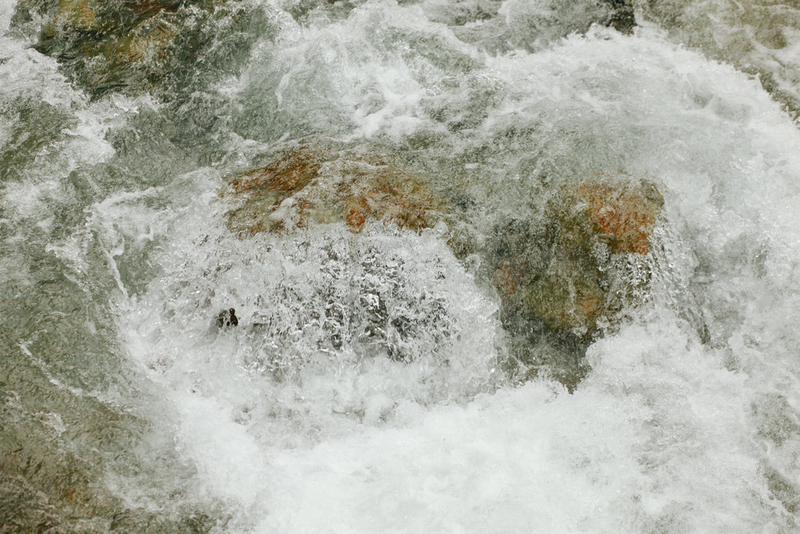 This hiking trail has great scenery and the relaxing sound of the water rushing...more so if you go on a rainy day like we did. 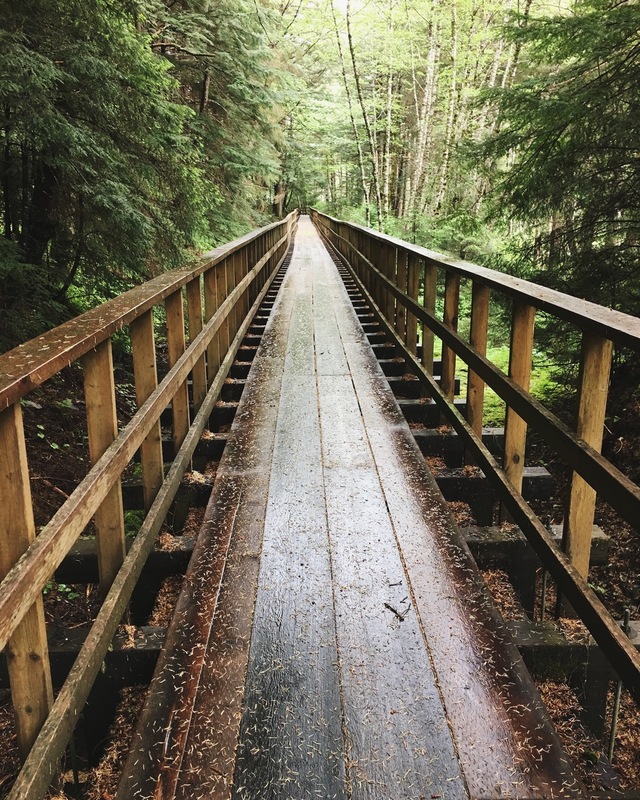 It wasn't pouring when we went, just a light rain, but Flume Trail is a nice covered walking area for those rainy Juneau days. My Dad and I were amazed by the giant wooden bridge we had to drive over to get to Flume Trail, I've never seen anything like it. More hiking trails, restaurants, and places to visit in Juneau, Alaska. Also, I've had an increasing number of site visits from people wanting travel info for Juneau as they head there on their summer adventures. If you're heading there soon (or planning your dream trip for someday), I'd love to know any questions or topics you'd like covered besides just my Places to Eat and Places to Visit posts! Leave a comment with anything you'd be interested in having me cover: packing tips, my top picks (if you're stay in Juneau is short), etc. We lived in Juneau for two years I've traveled there too, so I'd be happy to answer any questions!